When you are young, you rarely realize how smart your parents were. Mine bought me all kinds of educational toys. One birthday, I got an optics experiment lab that culminated with building a working 35mm camera. I did every step in that lab, and eventually built the camera. OK, it was inexpensive plastic, yes. And while I never did manage to buy film for that camera, I learned all about concave, convex, chromatic aberration and other principles of optics. One of my favorite educational toys was a subscription to "Things of Science." Every month, I'd receive a little envelope or a blue box with science stuff. There would be a small booklet, often with plastic or cardboard parts in the box. The people who came up with this were geniuses, as they managed to package a lot of science into a tiny, inexpensive kit every month. It was hit or miss each month. Sometimes, the article wouldn't interest me, or I'd just not be patient enough to do the experiments. Sometimes, it would be really cool -- like they'd send enough chemicals to grow a small plant hydroponically. Or send some plastic lenses in cardboard holders to do optics experiments. I played with those lenses for months and months. And while not every kit was a hit, it at least got me to study some element of science for a few hours each month. 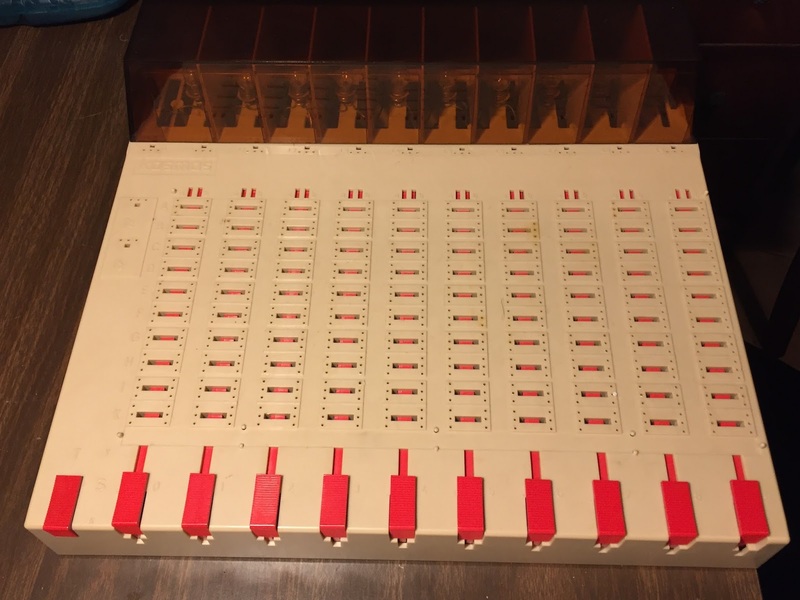 The actual "computer", sans wiring. A couple of years ago, I found something from my childhood in my father's basement. 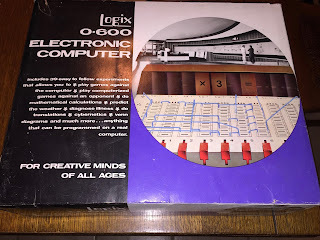 It was a 1971 Logix 0-600 "Electronic" Computer kit. I use the quotes only because this kit contained no electronic components. It's just a battery holder and ten lamps, a SPST pushbutton, and ten ganged ten-way SPST switches. 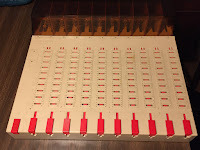 The switches provide data input, the lamps show the output, and the switch connections are wired by sticking pieces of wire into holes that make contact with metal clips -- very much like a modern solder-less breadboard. The first part of the manual contains assembly instructions. These are easy, provided you can turn a screwdriver and strip a wire. I must have been 11 or 12 when I received this kit, and I did the assembly entirely myself up in my room. part of the whole kit. This kit was really brilliant. 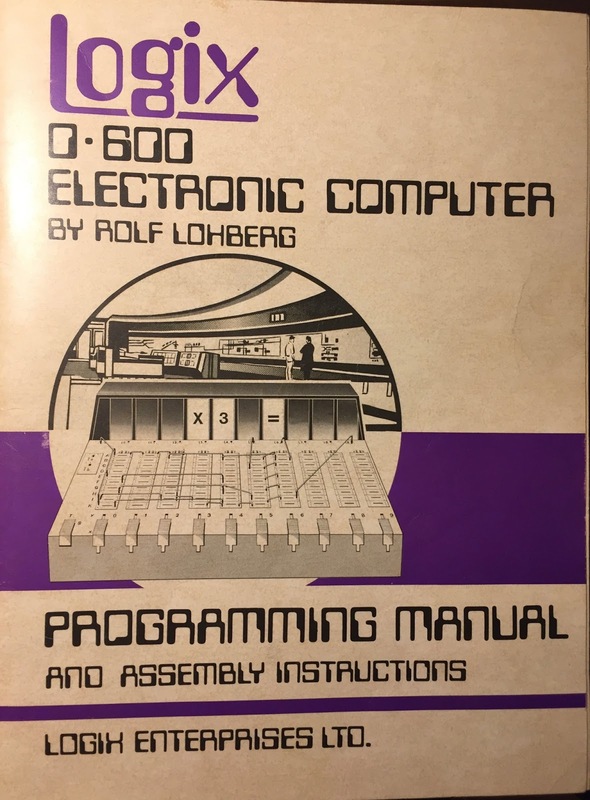 Despite the lack of any electronics, the manual shows how to build 39 different "programs." The switches were used to enter the input, and tissue-paper overlays are slipped into the transparent amber lamp cover to label the output. Each program had a clear wiring diagram. All you had to do is read the program description, and follow the diagram. So long as you wired it up correctly, the program would work as advertised. The ganged switches were sometimes a little flaky, but not enough to detract from the experiment. Through the series of programs, the kit teaches some of the basic logic and computer principles -- AND gates, OR gates, NOT gates, Addition, Counting, binary numbers, Venn diagrams and more. I do remember working through all the programs, and even trying to develop a few myself. At one point, I figured out how to wire up a program, but realized it required a 12-way ganged switch, instead of 10-way. It was beyond the capabilities of the 0-600. After I ran through the programs in this kit, I don't remember using this machine much more. But it was a real learning experience. The experiments taught me a number of important logic and computer concepts that I later used in my education and in my career. Having it now brings back fond memories.